As a mother of three boys, my life is full of dirty socks, strange smells, and enough noise to wake the dead. My friends who are the mothers off all boys are all shaking their heads right now in empathy because they KNOW. 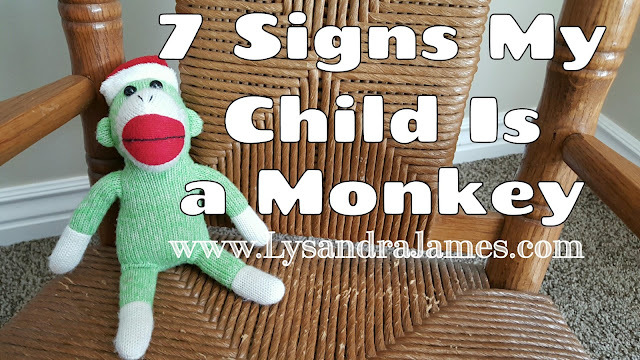 While my oldest two are crazy in their own rights, I'm convinced my youngest is a monkey in disguise. I have proof, too. My child climbs on EVERYTHING. Without fear. Bookshelves, dressers, the outside of stair railings, trees, and anything of a vertical nature. He's done it since he's been able to pull himself up onto the couch. Every piece of furniture in this house is now bolted to the wall because he managed to tip a five-foot dresser despite it having been tethered to the wall. He prefers to perch on top of couches rather than sit on the cushion or even on the floor. Unexplained brown smears on floors, furniture, and walls (six feet up - don't ask me how that happened). I want to say it's chocolate or mud or barbecue sauce, but honestly? I have no clue and I don't want to know, either. Screeching crazed enough to scare off a banshee. There are times I have to check to make sure the howler monkeys from Disney's Tarzan aren't in my child's room. The ability to destroy a room in mere seconds. I wish I were kidding. There have been times where I have walked out of a clean room to put something away only to return to a disaster and no child in sight. An aversion to clothing. Or rather, the changing of clothing. Ever since he was a baby, this child has been nearly IMPOSSIBLE to get dressed or changed. There were times when it took two people just to change his diaper. And once he's naked, it's a battle to get anything to cover that skinny little behind. Once, when I told him he didn't need to wear a swimsuit to get into the kiddie pool, he eagerly stripped down to nothing and tried to walk outside. No shame in that one. No shame at all. Bananas. He's obsessed with banana flavored yogurt. Yes, I know this one is a stretch, but you haven't seen how many times he's sneaked yet another yogurt from the fridge. Also, his technique for peeling a banana is positively primeval as he attempts to tear one off and opens the rest of the bunch in the process. Peeing indiscriminately. Yes, he IS potty trained. That hasn't stopped him from peeing on the outside of the bathroom door because I was taking too long. Or on the floor because he wasn't paying attention to where he was aiming. He even peed on the nurse right after he was born. Yes. My child IS a monkey, despite what the doctors say. It's a good thing that, like monkeys, the kid is so darn cute and sweet. Otherwise, I may have sold him to the zoo a long time ago. When the monkey business began. Happy fifth birthday to my monkey child!